Sweet raspberry filling is surrounded by moist and dense cake and topped with cream cheese glaze. 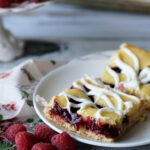 These Raspberry Cream Cheese Squares are a breeze to make and make a big batch to boot. Next time you’re looking for a crowd pleasing dessert, you’ll know just what to bake. I’ve officially been a working woman for a month now. It’s weird. I feel like I can finally cash in my responsible adult card. Like when I go to my next high school class reunion and people ask me where I’m working and what I’ve been doing with my life, I’ll actually have an answer this time. A real answer, though I will kind of miss telling people I’m a trophy wife. I always got a kick out of that. It always gets the best bug-eyed looks in response! Even though I really like my job and the hours and the people I work with, I kind of feel bad that I have less time for blogging. I used to put in 3-4 hours of work a day on Accidental Happy Baker and now I’m lucky to put in 5 hours a week. 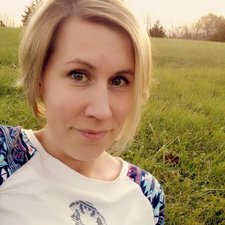 To be honest, in the back of my mind there had always been part of me that hoped I could be the anomaly, that I could one of the few to make a full time living from blogging. Now I’m forced to accept that Accidental Happy Baker was, and is, and will more than likely always be, just a hobby. And that’s okay. Of course, a lot of these feelings are compounded by the season. The kids are out of school for the summer and I don’t want to miss out on any more time with them then I have to either. When it comes to blogging and my kids, the kids always, always, always get top priority. It just passes by so quick! Soon my oldest will be a senior. Now is the time for staying up late watching silly shows on netflix and for games of catch and trips to the swimming pool. There will be time for blogging still when they are grown and gone, not the other way around. Obviously with so much going on I haven’t had as much time in the kitchen as what I would like, but I would go crazy if I wasn’t able to get in there and bake. It’s my happy place. It’s what makes me relaxed. It’s my go-to stress relief. I was asked to make desserts for a community event a couple weeks ago. That week was particularly busy, so I knew that I wanted to make something that was quick, but fancy, and that made a large batch. I came up with these Raspberry Cream Cheese Squares. These squares are a variation of one of my most popular recipes on AHB, my Cherry Almond Squares. I LOVE THESE SQUARES! These things are the easiest to whip up. They rely on convenience items like cake mix and pie filling, but taste like they are made 100% from scratch. One of the ladies at the event asked me if they were completely homemade, when I told her no, that they started with cake mix she squealed and told me, “That makes me love these even more! It’s something that anyone could make.” And it is. Super simple, crowd pleasing and done in 35 minutes. 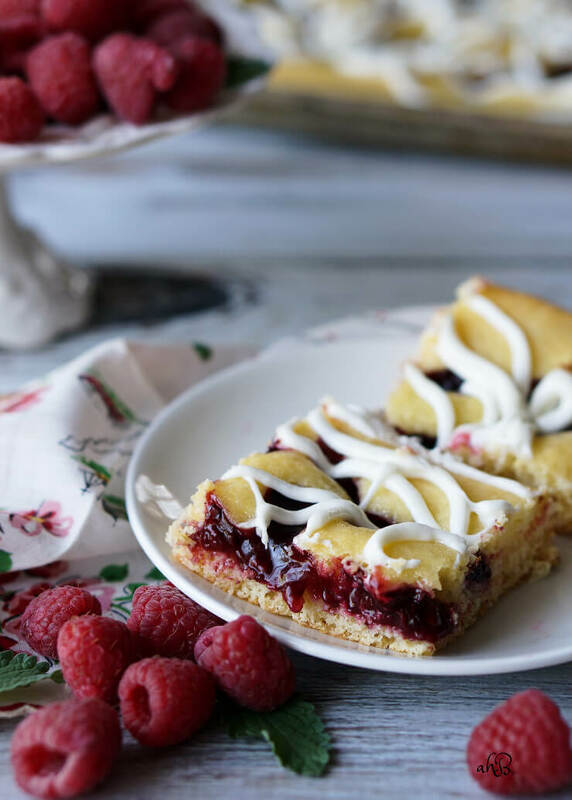 These Raspberry Cream Cheese Squares are what would happen if pie and coffee cake had a love child. 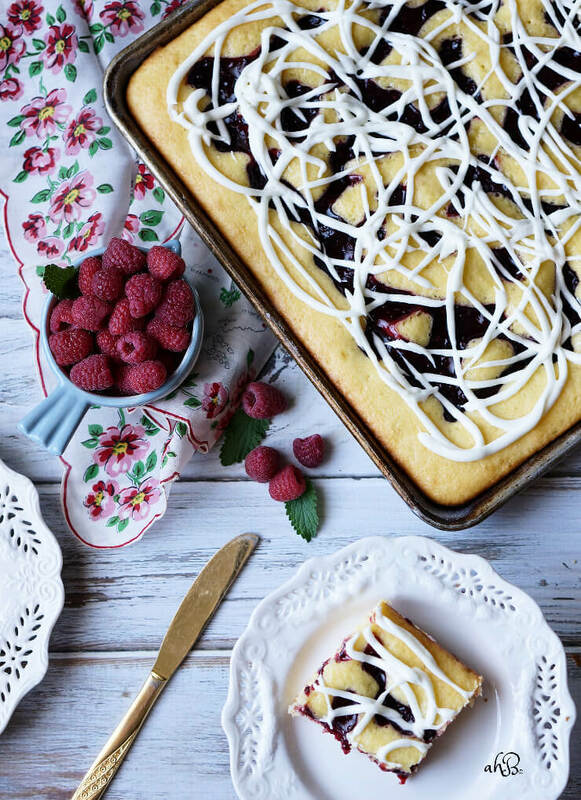 Sweet raspberry filling, moist and dense cake, and topped with a cream cheese glaze. What’s not to love? 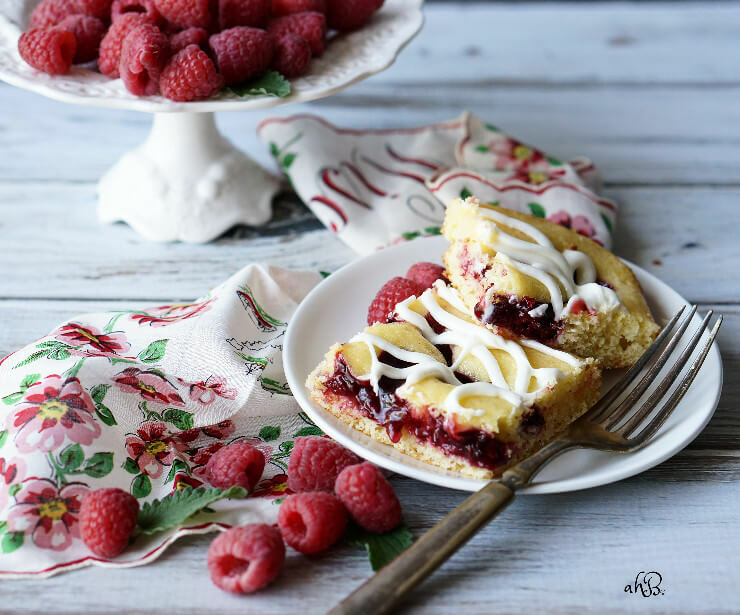 Raspberry Cream Cheese Squares have a sweet raspberry filling that's surrounded by moist and dense cake and topped with cream cheese glaze. In a medium sized bowl, mix together the sour cream, water, and eggs. Stir in the cake mix until moistened. The batter will remain slightly lumpy. In a small bowl, beat together the cream cheese, lemon juice and powdered sugar. Add in the milk starting with 2 Tablespoons adding more until the glaze reaches the desired consistency. Thanks so much for pinning Eva! Send me a picture if you make it! Sounds yummy!!!! And I love your pictures. That hankie (at least I think it’s a hankie) makes me think of my Grandma Kern. She always had hankies – and I had to iron them. Thanks Kathie, these squares were a lot of fun to photograph. The hankie in this picture was one of the ones my aunt gave to me from my Great Grandmother’s belongings. It just accompanied the raspberries so well. It’s actually an old souvenir and has a map of Wisconsin printed on it. You just can’t really see that part in the pictures.